Mirror Mirror on the Wall… Let Google & Yahoo search them all…. What do people search for on Google? What do you search for on Yahoo? What are clients, friends, and family searching for? Seems our entire lives are spent in search of something? The questions is, are we ever really finding exactly what it is we’re looking for? Google and Yahoo put alot of time, money, and resources into making sure that you do, at least on the Internet. In this post, I put the TOP TWO to the test with a question I get asked often by non-members. Where do I need to be on the Web? TIP: There’s “Google Juice” and there’s “Yahoo Koolaid” out there as well, and people do search drink from both. This is fascinating and enlightening. Out of 107,000,000 page results for one search, and 968,000,000 page results for the other, these results made me realize how valuable and important being on ActiveRain really is. Not to toot our own horn here…OK, maybe just a little, but if you’re in the Real Estate Industry, there’s some obvious advantages why you should be on ActiveRain. Those who have already joined AR know first hand the power of Social Networking and the results that can come from Real Estate Internet Marketing and Blogging. 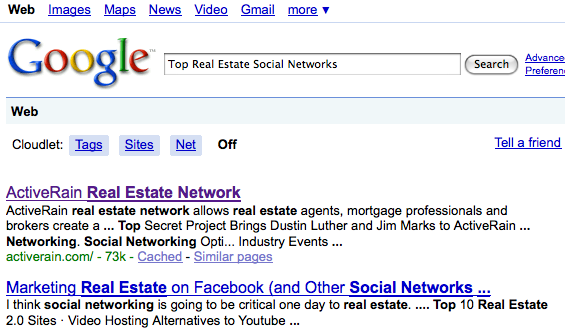 Take a look at these results for the following “search terms” in both Google and Yahoo. So Are the Search Engines Correct? Are they accurate? Depending on what you’re looking for, they sure can help. Remember that Millions of People are using them everyday. My main point here is that if you’re not a member of ActiveRain and you’re in the Real Estate Industry, NOW might be a really good time to consider becoming a member of the #1 Top Real Estate Social Network in the world. If you’re already a member, this is a great time to tell a friend or colleague who isn’t. Sharing these results may open their eyes. ActiveRain is #1. Don’t take my word for it, ask Google and Yahoo. I trust their opinion 100% on this one. JOIN ACTIVERAIN HERE! UPGRADE TO RAINMAKER HERE!